Re: Post your Severe Weather screenshots of GRLevel! 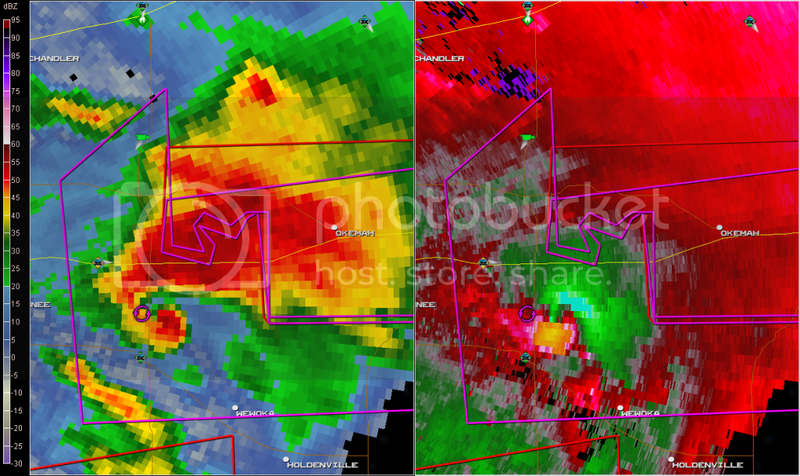 Same storm on two different radars, both indicating a rather strong hook, or at least rotation, still exists within this storm. Looks like I'll be digging into NWS LII data tonight after it calms a little to analyze these storms today. I just need to purchase GRLevel2 and maybe consider getting GRLevel2 A.
I cannot believe that this is the same storm that hit Norman and Moore. Here's one of the multi vort tornado east of OKC yesterday. I don't like to use smoothing b/c I can see the structure much better. Hook on the northern end of the squall line northwest of Wichita this afternoon. Large hail is expected today within and around Tornado Watch #155. Hook on the northern end of the squall line west of Wichita this afternoon. Storm chaser Chad Cowen has reported a tornado with this cell appx 10.5 miles south of McPherson. Still showing a really good hook though. MILES SOUTHEAST OF MCPHERSON...MOVING NORTHEAST AT 35 MPH. It looks like these storms are taking off the front and going off on themselves. In the last hour these storms have split up into sections, and eventually started to rotate. More resides in northwest Oklahoma. Same storm NE of Pretty Prairie, KS. Outflow boundary (red stripe on velocity) headed towards Wichita. Public reported 81 mph wind gusts in Goddard. HAM Radio operator reported 80 mph winds 5 E of Norwich. straight lines blowin 80 will do some damage. I wonder if there was any reported? And yes, there was probably damage in Wichita/near Wichita this afternoon, I don't doubt it. May 18th in Texas panhandle. Warning polygons aren't showing up on radar for some reason, and the info pane shows nothing. That's an impressive storm, there are plenty of reports with it. Anybody have Wednesday's radar images? I was traveling (away) from these storms (hell I wasn't even near them to begin with) on my vacation. First you'll need to save your images (which you have I will assume). They're the one and the same (aren't they?). Page created in 0.093 seconds with 50 queries.